We left Kanchanaburi yesterday afternoon and headed for Damnoen Saduak (where the floating market is held) - by way of a small town called Bang Phae. As the bus pulled out of the bus station, we started to wonder whether we were sitting on the correct one. Looking at a map, there appeared to be several towns with a similar sounding name. And they were all in very different directions - there was a Bang Pae (near Phuket), a Bang Pa-in (near Ayutthaya) and we passed a Bong Pan. Since Thai is a tonal language, we wondered whether we had pronounced Bang Phae properly. It was too late now, so it was a case of sitting tight and hoping for the best. Fortunately, we'd made it to the right place and weren't so tone deaf after all! We stayed the night at Noknoi Hotel, ready for an early start this morning to beat the coach loads of tourists from Bangkok. By 7am we were on our way to a long tail boat, to catch a glimpse of this famous colourful market. The boat weaved in and out of the canals and we passed several ladies wearing wide-brimmed bamboo hats, paddling their ladened boats to work. As we passed the residents who lived alongside the river in their wooden shacks, it occurred to us that this canal was used for more than just transportation. People were washing their clothes in the water, rinsing the shampoo from their hair, brushing their teeth, bathing and washing their dishes in it. These residents must have strong stomachs! Some of the bridges across the canals in this residential area were very basic. A bamboo pole that was the 'path' and another bamboo pole suspended higher up so you have something to hold on to for balance. It looked pretty precarious to me! Coconut seller decides to do a U-turn in the Floating Market. Lucky she did this before rush-hour! We stopped off at a coconut sugar-making factory, which also housed tourist souvenirs for sale. [Ian adds: actually, it was a bit like saying "Do you want tea with your sugar?" The 'factory' occupied less than 10% of the floorspace. The other 90% was all for selling souvenirs. There can't be much money in coconut juice!] We were offered some complimentary drinks made from the sugar and it tasted nice, but I soon put it down once I clocked the swarm of flies buzzing around the processed sugar in a mad frenzy. 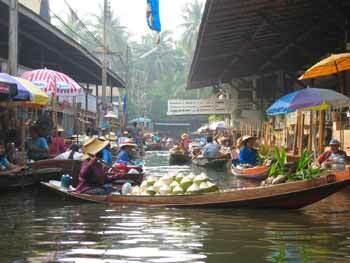 Our first sight of the floating market was a marked change to the almost deserted canal ways leading up to it. We had arrived just when the market vendors were setting up i.e. paddling their boats to the perfect spot and having a natter with other market traders. The canal was still fairly quiet at that point. 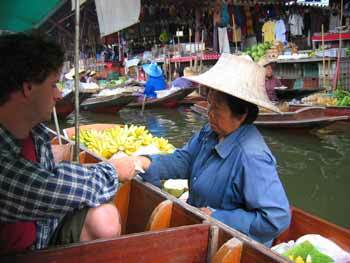 We could see fruit sellers and other wares being sold like rice and curry dishes, hats, flowers and souvenirs. Further down the canal, there were permanent stalls set up on the side, selling clothes, painted fans and more souvenirs. You could walk to the market and view some of it from dry land but to get a closer look, the boats do a good job of taking you into the thick of it. Just take a look at that old fruit. No, I mean the green stuff in front. The market vendors, who all seemed to be women, are used to seeing tourists snapping away with their cameras. They have become so used to it that they don't even bat an eyelid and continue as if they haven't spotted you holding a clunky bit of equipment and pointing it in their general direction. This wasn't always the case but now the market seems to operate largely for the benefit of the tourists. Seeing that we were not interested in buying souvenirs and knowing we had two hours to fill, our boat guide took us to a fish farm. We bought some fish food and fed the fish for ten minutes. The canal was teaming with fish, splashing around and breaking the water's surface as they bounced off one another to get to it. We then had another quick photo stop at a wat with a big Buddha (we didn't get the name) along the river's edge before returning to the market. It was getting busier and I can only imagine the traffic jams after 9am. 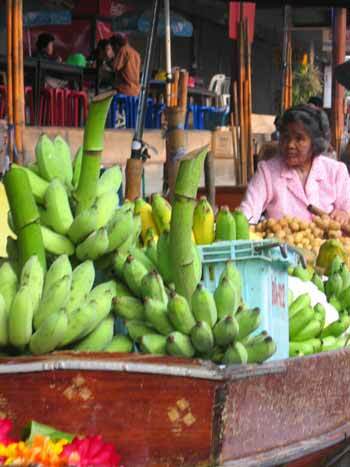 We picked up a spot of breakfast on the journey back through - a bunch of bananas for 10 Baht, which was our only expense (apart from the boat trip itself) on this shopping trip. An exchange of coins and bananas. "Nice doing business with you." Despite having to wake up so early, it was a good idea to do the trip at that time of day when the sun wasn't too strong and the crowds had not arrived. We managed to leave before the scrum descended upon the tranquil town and managed not to hit traffic on the way back, making it into Bangkok just after 2pm. We spent the rest of the afternoon relaxing and catching up with Stef and Am. When we left for Kanchanaburi, we had planned to be away for a few days, but had been gone almost a week. I think it's safe to say that we are now working on 'Thai Time'.